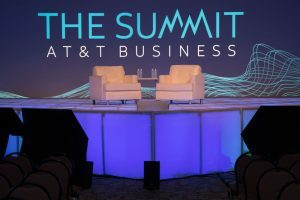 Big events come to Dallas all the time, but the first annual AT&T Business Summit really pulled out all the stops. A private performance at AT&T Stadium by Aerosmith was only the tip of the iceberg. (And when Aerosmith is the tip of the iceberg, you KNOW it's a big event!) AT&T also rented the entire Gaylord Texan Convention Center and Resort with forward-thinking exhibits in the exhibit halls, and interactive speeches by Randall Lynn Stephenson and GW Bush during the general sessions. Darius Rucker performed at the Gaylord to round out the award-winning talent, and several breakout sessions discussed the future of telecom. Thanks to our friends at Orbital Motion, the crew of In Depth events was a big part of the general session, providing an exciting main stage for the event. In one of the most innovative uses of our LED stage surfaces, we provided an amazing triangle shaped, LED lighted stage for the main stage of this conference. Months of design work and preparation paid off with a truly stunning stage for this international group of attendees. However, our LED lighted stage wasn't the only thing we provided for this show. 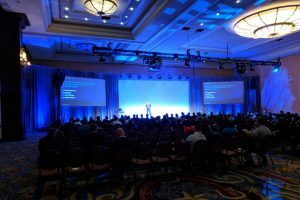 A laundry list of six large audience risers, pipe and drape, stage marley, and thousands of square feet of carpeting were needed for the general session ballroom. The breakout rooms all needed stages, carpeting, and elevated seating as well. Coordinating with the riggers, decor, lighting, video, and audio was no small task during this three day build. However, the staff at In Depth Events banded together to make sure every task that we contracted for was completed to meet or exceed client specifications. If you'd like more information on the creative uses of our LED lighted stages, our audience seating risers, or some of the other aspects of our staging rentals, we'd love to hear from you. Please contact us and let us know how we can be of assistance to your next event!